I’ve just released version 1.0 of Grout, a program which solves certain classes of tile-placing, edge-matching puzzles, such as that illustrated here. 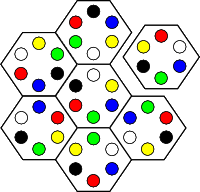 I originally wrote it to solve specifically six-sided puzzles for a programming competition back in 2001, but then generalised it when I came across a four-sided puzzle at a friend’s house. I can probably find one or more uses for this, but I need to know something before I download this: aside from opening the tarred and gnuzipped file, what else would make it difficult for me to install this on my WinXP machine? Craig: nothing. All you need is a JVM – Sun’s will do fine.